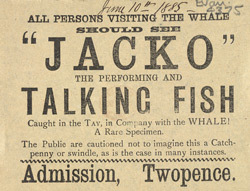 This leaflet is advertising a performance of 'Jacko the performing fish'. Performing animals were popular exhibits at natural history shows and circuses during the Victorian period. They were trained to carry out feats such as balancing on balls, retrieving objects and seemingly to count at their owner’s command. As you can imagine many of these astonishing animals were actually forged and were created by the proprietor of the attraction to catch the attention of the public.